Refresh your skin with Real Chemistry Fresh-Start Foaming Cleanser, a revitalising cleanser that lifts away makeup, oil and impurities to leave skin fresh and revived. Infused with a host of hydrating ingredients and deep cleansing Amino Acids, the cleanser expertly refreshes and moisturises skin whilst imparting a natural Grapefruit fragrance to invigorate the senses. Expect a smooth and soft complexion. 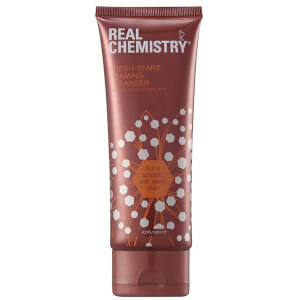 Dispense a small amount of cleanser onto fingertips and gently work into a foamy lather. Massage over the face in light circular motions. Gentle enough to use on eye lids and under eyes. Keep out of eyes and avoid ingestion into nose and mouth. Rinse with cool or warm water. Repeat morning and night. Aqua, Sodium Lauroyl Sodium Chloride, Oat Extracts, Glycerin, Sodium Laureth Sulfate, Glycol Disterate, Beeswax, Glyceryl Stearate, PEG-100 Stearate, Sodium Chloride, Potassium Hydroxide, Hydroxyethyl Cellulose, PEG-150 Disterate, Diazolidnyl Urea, Iodopropynyl Butylcarbamate.